Dreaming … with the joy in the pursuit. It has been exactly one week since becoming the 2nd fastest marathoner in Canadian history with my personal best time of 2:28:32 at the 2013 Scotiabank Toronto Waterfront Marathon. 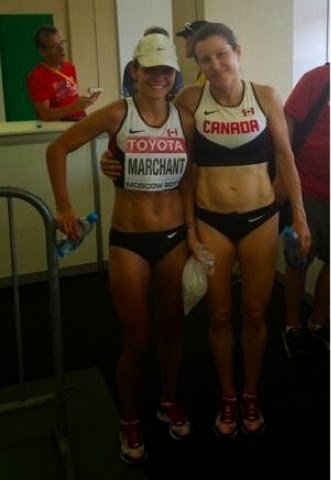 My teammate and healthy rival, Lanni Marchant captured the record just ahead of me, with a speedy 2:28:00. We were both ecstatic. 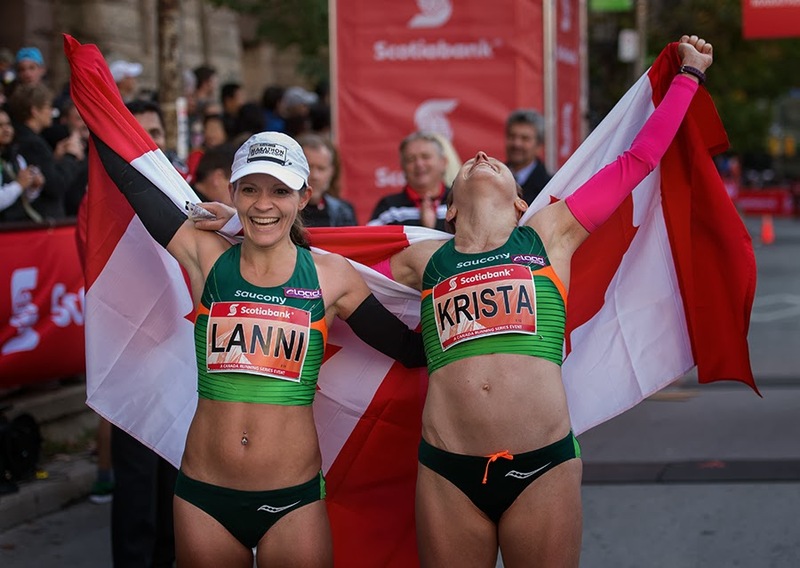 You can watch our race, interviews, and historic finish with Canadian flags and a lot of hugging & smiling at this link, CBC race coverage 0:55:26-1:02:20 and 2:41:30-2:45:20. It is still sinking in. I am grateful and enjoying every minute, feeling so very blessed that my hard work was put to good use on a beautiful day with hundreds of people behind me, cheering and praying for me. From the tears, vomiting, and smelling salts in Moscow to the smiles, celebrations and redemption in Toronto, it has simply been amazing. One thing I can’t help but think about this past week is dreaming. I’ll keep repeating that I believe God has given me this gift and I think that part of that includes dreaming. Dreaming big. Wikipedia defines dreams as successions of images, ideas, emotions, and sensations that occur involuntarily in the mind during certain stages of sleep. But my dreaming has been more voluntary while awake! Not every dream works out exactly the way we imagined but God is sovereign and everything works out for a reason, His reason. 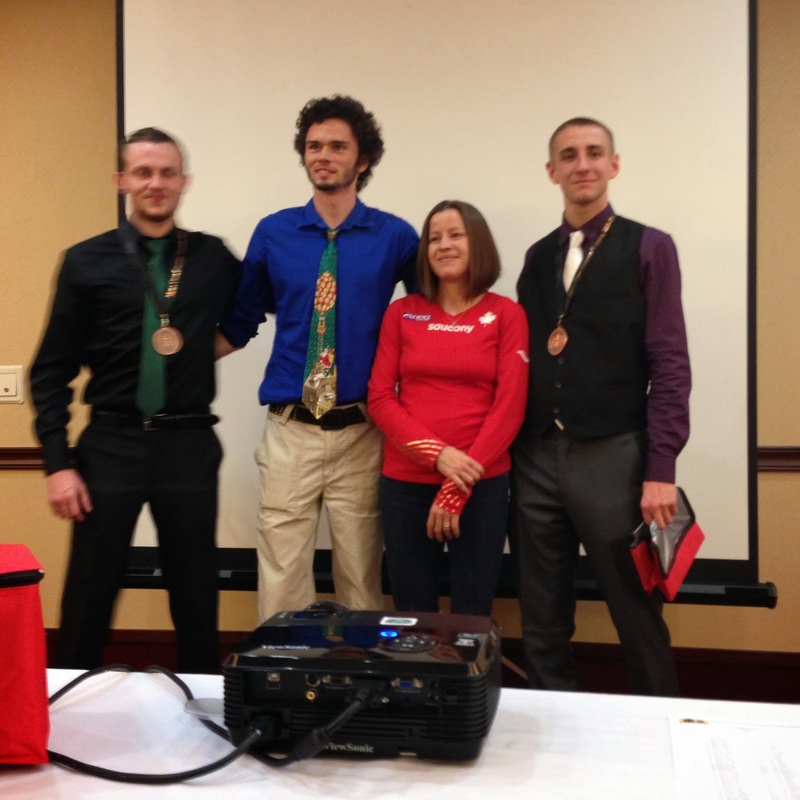 Running a marathon…getting faster…getting sponsored…getting faster…becoming a professional marathoner. Running at a major game i.e. World Championships. Being one of the fastest marathoners in the country. Sharing my faith and life story e.g. 100 Huntley Street. Living near family so that our kids, nieces and nephews can grow up together (we live 5 houses down from Jonathan’s sister, and spend much of our summer time with my sister at the Christian camp where I grew up). my goals. I set the bar high. Running the standard for and competing in the 10,000 m at the 2014 Commonwealth Games. Running the standard for and competing in the marathon at the 2016 Olympic Games. Running my last competitive marathon as the very best of my life (isn’t that how every athlete wants to retire?!). Serving with the Start2Finish program in Canada. Serving with the Kenyan Kids Foundation and my family in Africa. Supporting the Canadian Cancer Society. With my husband, raising our children to know, love and serve God. Enjoy the pictures and links below. It’s been a great week. What a great start to Saturday! Despite the nasty wind and rain, Clayton, James and I enjoyed a run (my first since Sunday’s marathon) together followed by coffee afterwards. What a treat! These two guys are wonderful and I cherish our friendship. 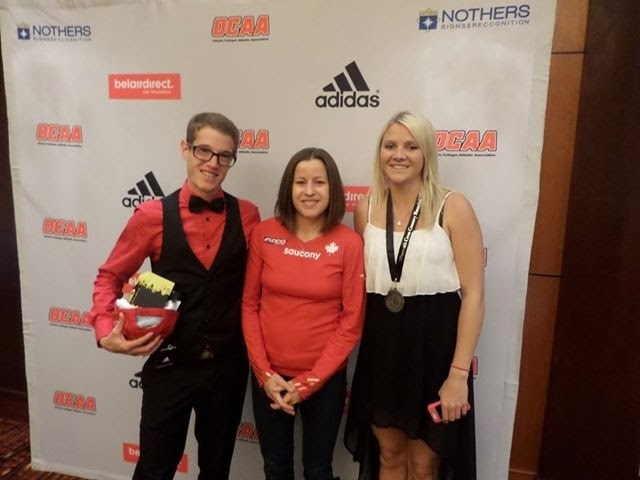 James (right) has a sister (Jen) who, as a marathoner and mom of 3, inspired me, and James suggested some time ago that I make running my profession. And Clayton (left), a father of 3, has been my running buddy for 10+ years. Spending hours between a surgeon and engineer makes for very interesting runs; from details of hip replacements to mechanical designs, and a lot of joking and laughing together, there is never a dull moment. As promised, we finally made a trip to Menchies for some sweet sundaes after purchasing the items for the Operation Christmas Child boxes. It made for a fun family evening, which I see being a yearly tradition. 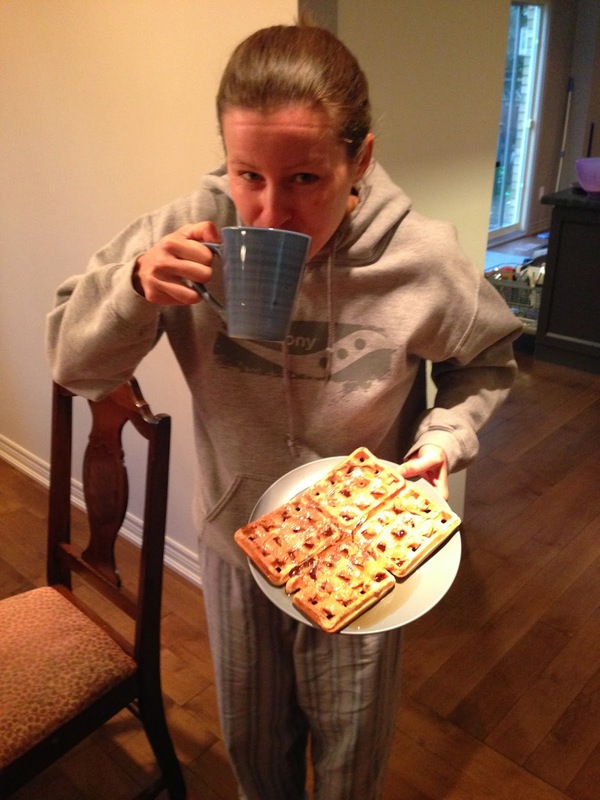 After my run and coffee, I got back in my pyjamas and enjoyed Jonathan’s weekend waffles with the family. Oooooh, the delicious, real maple syrup made by Uncle Roy and Aunt Marilyn, that had been hidden since Easter…it was so good! For anyone who with kids, I’m sure you can tell what this picture means. 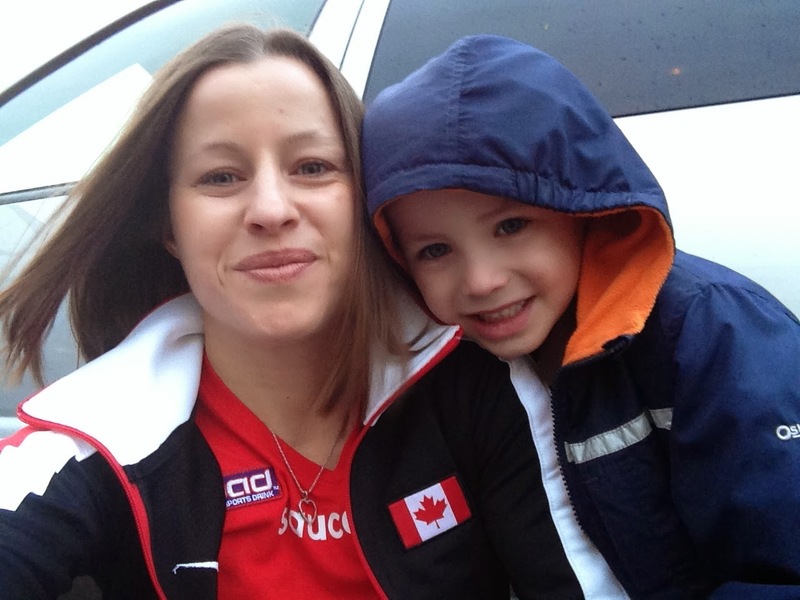 Another baby or an attempt at qualifying for the Olympics makes for a tough decision for any athletic mom! Glad the money made in selling our baby stuff at the church yard sale will go to the Yugo missions trip. My 5 year old, Seth, joined me at the Ontario Colleges Athletic Association cross country banquet where I was guest speaker. I was honoured by the line of people wanting a picture with me. And Seth was delighted to take over 200 (!!!) pictures with my phone. Even the athletes got him to take pictures with their phones! He has since decided that instead of a police officer, he now wants to be a photographer. Petrolia LCCVI grads at the OCAA banquet! When I asked Seth what he enjoyed about the evening, he said: 1) the hot chocolate on the way home, 2) the garlic bread at dinner and 3) taking the pictures. I asked him what he thought of my talk and he said, “Well, it was boring because I had to just sit there.”! Coach Rick Mannen and I will be doing some talks in the community, including one for a North Park Highschool Phys. Ed. class. Both Kevin Sullivan and Ben Sayles are North Park grads. Our talk is one way we can say thank you for letting us use their track during their class! Rick has been and will continue to be an amazing coach/manager in my running career. Thank you, Rick (and Josie). We met Friday to discuss 2014 and are quite excited about it. The plan is to take it easy for the rest of 2013 then start training and racing 5 and 10 k’s in early-mid 2014. Ideally I’d make the 10, 000 m (track!) standard to race at the Commonwealth Games (July), and go for the Olympic Games standard in the fall (October) IF the qualifying period is open like it was for the 2012 Olympic Games. Tune in to see me on 100 Huntley St. in November. I’ll be doing a pre-recording this week, instead of live, Oct 30. Looking forward to getting involved with Start2Finish in the future. 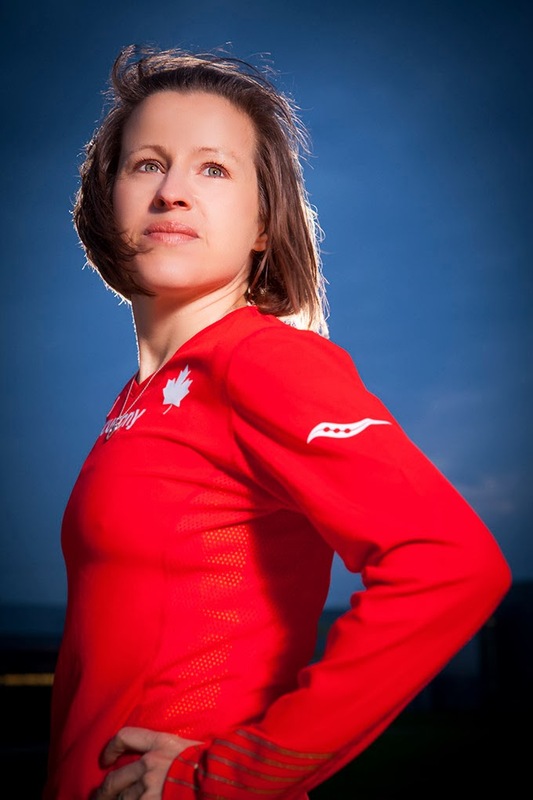 Silvia Reugger established this organization, using her running career as a platform. 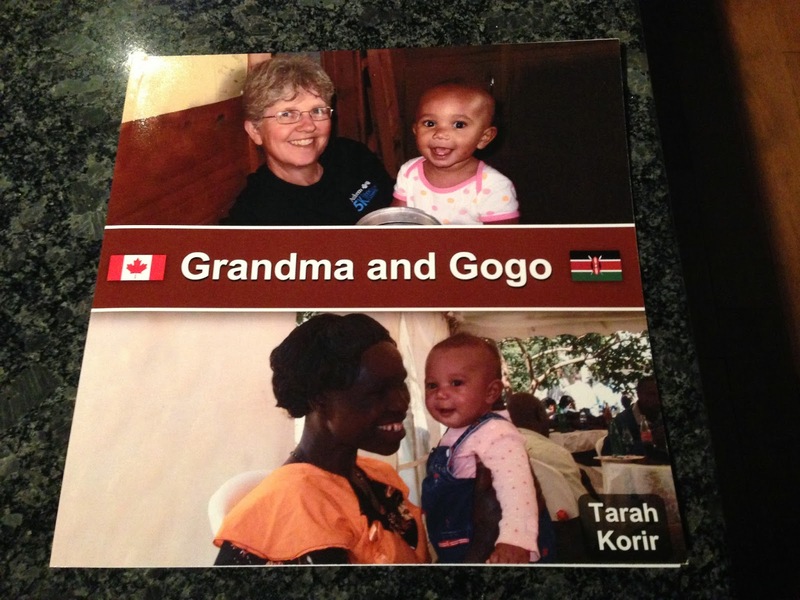 Exciting things are happening with the Kenyan Kids Foundation – Canada, including planning for the new, “Harvest Half” Sept 12-13, 2014. More details to come! Canadian Cancer Society. Glad I can continue to promote health and wellness in support of #fightcancer! I’ll be at the Hamilton Road2Hope Marathon, November 3. See you there?! …My dear friend, Britanie who is now over half-way in her chemo treatment, has spent many nights at the RMH. 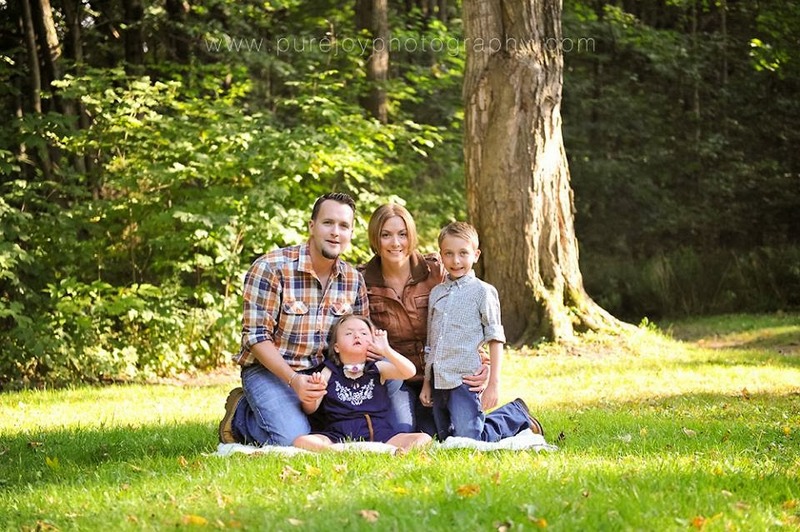 Her special needs daughter, Chloe, who just turned 6 last week, has had many surgeries and serious illnesses since birth. The Summerhays family is grateful for the support received from the RMH. I am in absolute awe of people like Britanie who take these gorgeous, courageous pictures while going through chemo. I can’t wait to wear matching hats with her in the upcoming cooler weather. Thank you, Saucony! 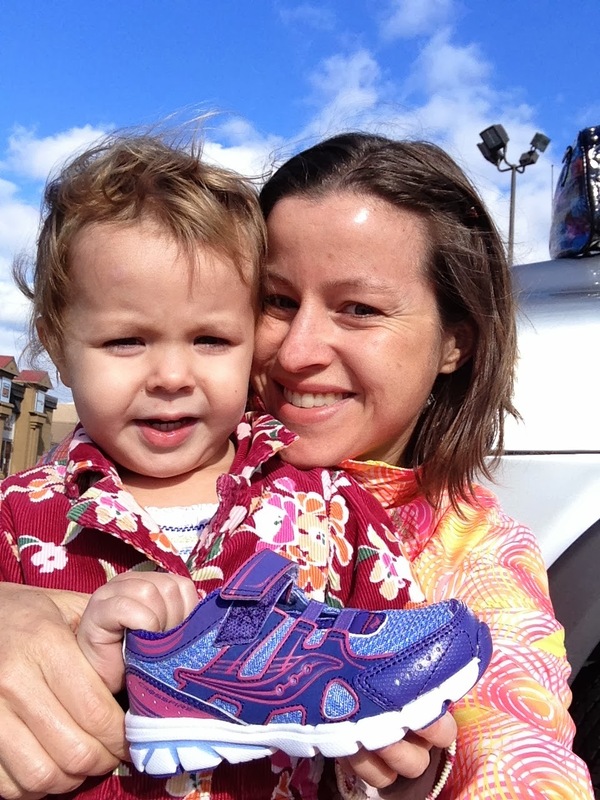 Leah was thrilled to get a new pair of pink AND purple Saucony running shoes when I returned home. 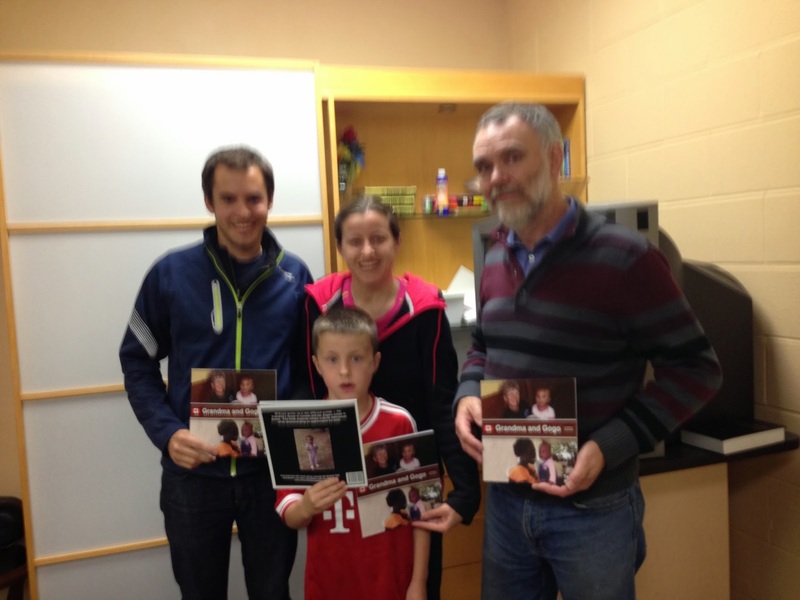 Jordan from the Waterloo Running Series, Blair McKay from the Kenyan Kids Foundation (KKF), Micah and with the “Grandma and Gogo” book. We are excited to announce our new, “Harvest Half“race, which will be Sept 12-13, 2014 to raise money for KKF – Canada. 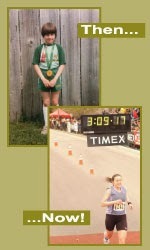 I will speak at the pasta dinner, Fri. Sept 12 and we will have a 21.1 and 10.5 km race on Sat., Sept 13. The course will be the same route that Wesley Korir (KKF co-founder and Boston Marathon 2012 Champion) runs when training in Ontario while visiting the McKay family. The book, written by Wesley’s wife and fellow KKF cofounder Tarah Korir, sells for $20 as it is currently a major source of revenue for the foundation. KKF – Canada is currently in the process of acquiring charitable status. 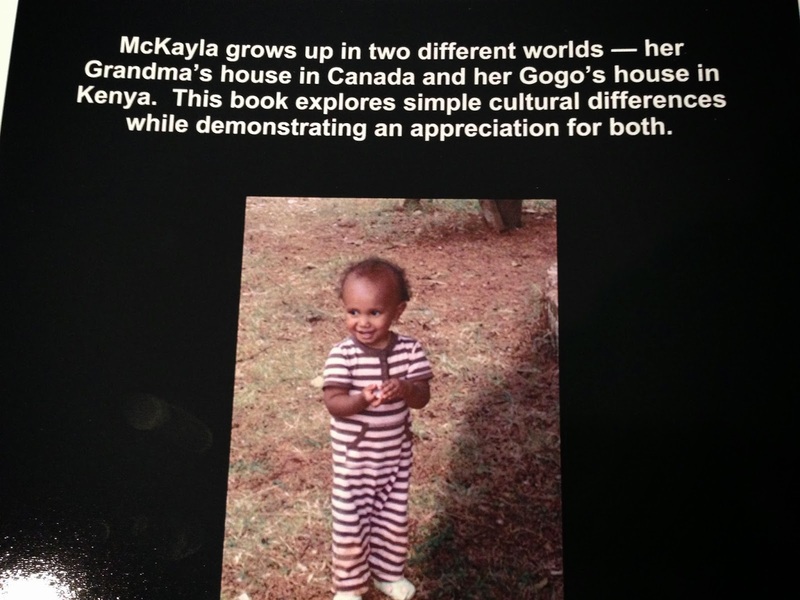 It’s a great book for children, and a great gift for family and friends. I’ll have some copies on me at the Road2Hope Marathon. Just ask! Leah and I enjoyed a different routine this week. 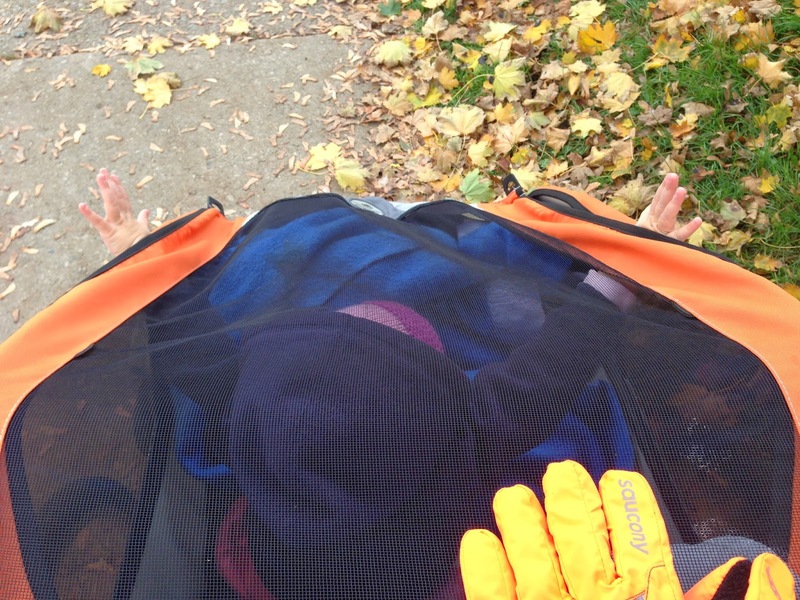 We went on several fall walks, enjoyed picking up a bit of lunch while out, and even did some shopping. I just love this time of year with the crisp air, sunny skies and colourful leaves. 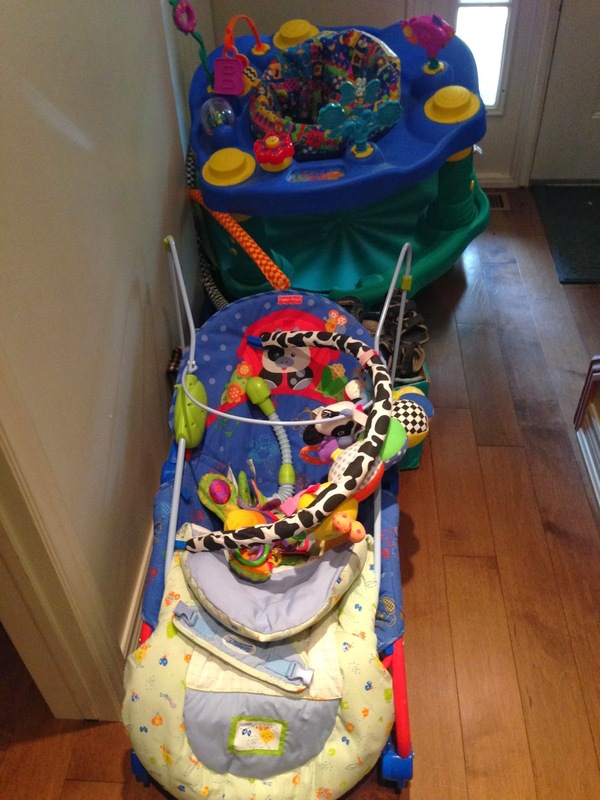 I’ve especially loved it when my kids stick their hands out of the Chariot, creating wings! 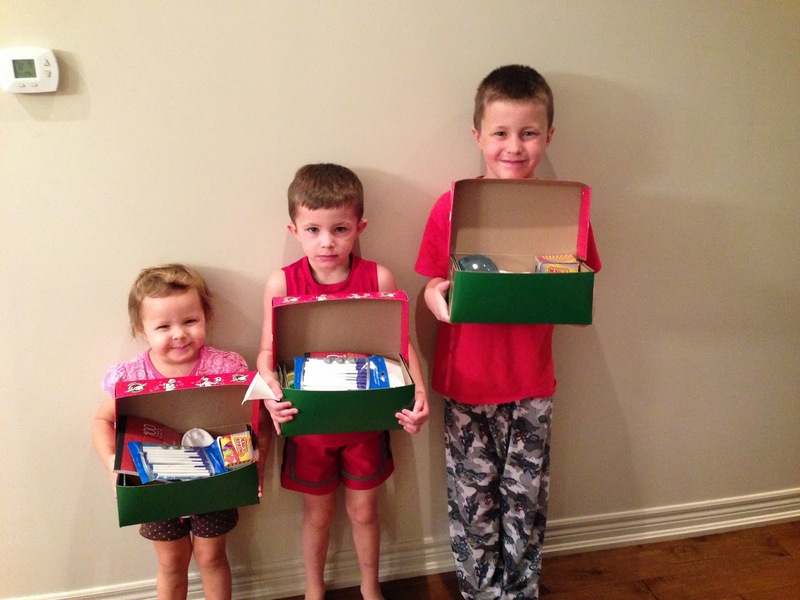 Get your Operation Christmas Child shoe boxes! Nice article and I am glad you got some rest this past week. MIssed your presence in the gym however. Hope to see you again this week, either at the gym or at the Road-2-Hope.